Two planets in the newly discovered Kepler-36 system approach each other so closely, one appears three times the diameter of Earth's moon in the other's sky. In our solar system, the orbits of the planets are widely spaced apart. For example, the closest planet to Earth, Venus, never comes closer to us than about 41 million miles (66 million kilometers). In the newly discovered Kepler-36 system, 1,200 light-years from Earth, there are two worlds that pass 30 times closer to each another than any planets in our solar system. Every 97 days on average, two planets of the ancient sunlike star Kepler-36 pass within 1.2 million miles (1.9 million kilometers) of each other. The planets get so close, an observer on the surface of the inner planet would see its neighbor appear about 2.5 times the diameter of our full moon in the sky. 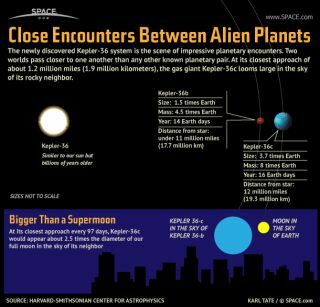 From the outer planet, Kepler-36b appears about the same size as our full moon. The planets were discovered through astroseismology, the study of how orbiting planets cause a star to resonate.